When we think about Canada, it isn’t oil that typically comes to mind. It's pristine boreal forests, glacier-capped mountains and crystalline alpine lakes that define Canada in the world’s imagination. But over the past two decades, intensive development of Northern Alberta's oil sands has made Canada the world's third largest source of oil, after Saudi Arabia and Venezuela. Oil development has deconstructed the landscape, and tarnished Canada's global image. It's been nearly 50 years since the Great Canadian Oil Sands opened the world’s first oil mine near Fort McMurray, Alberta. In that time, a once remote northern industrial development has grown into what many now call the largest and most destructive industrial project on earth. The scale of operations and scope of environmental damage prompted UN special advisor Maude Barlow to describe the landscape as “Mordor”, the bleak realm of J. R. R. Tolkien’s fictional Middle-earth. The contrast between our image of Canada’s North and its present-day industrial reality is jarring. It's taken place within our lifetimes, and largely beyond our sight. But recent events have brought Alberta's oil sands into the eipcentre of international clashes over energy, climate and the economy. The seven-year battle over Keystone XL—a 1,179-mile pipeline that would have carried 800,000 barrels a day of synthetic oil sands crude from Alberta to the American Gulf Coast—turned a routine infrastructure project into a potent political symbol of the power of industry over nature, and the apparent powerlessness of national governments to address climate change. Then in May of this year, a wildfire the size of Delaware forced the mass evacuation of 80,000 residents from the Fort McMurray area. It was the largest North American evacuation in recent memory. For a week or so, the international media was seized with cataclysmic images, but the fire continued to burn long after the story passed beyond the news horizon. Ultimately, it isn’t oil itself that is harmful. Rather, it's the way in which it's extracted, processed and introduced into nearly every aspect of our lives: through the nineteenth and twentieth centuries, oil became so entwined in our economies, politics, and culture that we now find it nearly impossible to free ourselves from it. For many, it's difficult to imagine a time before oil. Population growth in Fort McMurray and the price of crude oil. Fort McMurray is a classic boom town, its population linked to the price of its natural resources. The crown jewel of the oil sands is bitumen, a viscous form of petroleum. Northern Alberta’s tar sands are not tar, but rather bituminous sand. In its natural state, bituminous sand is about the consistency of a hockey puck. Shallow deposits are mined in open pits, while deeper deposits are drilled through in situ (in place) mining. Either way, it's neither easy to get to, nor easy to process. In open-pit mining, shallow deposits are extracted through a kind of a reversal of the earth’s evolutionary and geological processes. First the forest is cut down, then layers of the earth are dismantled: topsoil and peat, then clay and sand. The oil sands are scooped out and hauled away to crushers that break down large clumps. Bitumen is separated from sand with hot water. Water waste ends up in tailings ponds: massive pools of oil, water, chemicals, sand and clay. It’s the larger-than-life scale of open-pit mining that makes for the most dramatic images: the world’s biggest trucks, the world’s second largest dam, and tailings ponds that each day produce in waste what Toronto consumes in water. But 80 percent of Alberta’s oil deposits lay deeper underground, requiring a more advanced technological approach. In situ ("in place") mining injects steam deep underground, heating and loosening 110 million year old bitumen deposits so that they can be pumped out through a separate channel. While it leaves fewer visible marks on the land, in situ mining consumes significantly more water and energy. And since wastewater is stored where oil was extracted, it carries a contamination risk to the surrounding groundwater. The Province of Alberta requires that oil companies return mining sites to their original states: a process described by the government and industry as "land reclamation". Syncrude distills its reclamation process in a three-step animated GIF. A video from the Canadian Association of Petroleum Producers naturalizes oil mining as a “life cycle … from birth to rebirth”. A Government of Canada brochure cites "environmental standards that are among the most stringent in the world", reassuring citizens that oil companies will fulfill their legal obligations to restore land leased for oil mining to its functional, natural state. Colorful animations and government assurances gloss over a critical problem. Once dissembled by mining, complex and interconnected ecological systems cannot simply be put back together. Picture toothpaste squeezed out of a tube, or an egg that's been cracked. As of 2014, less than 1% of the total area disturbed by oil sands mining has been restored. As the Pembina Institute notes, "Restoration of wetlands continues to be a major challenge and may never occur . . . Peatlands, the primary kind of wetland habitat throughout the northeastern part of Alberta where oilsands development occurs, cannot feasibly be replaced using current reclamation techniques. " Many experts doubt whether it's possible to recreate the complex ecosystems disturbed by oil mining. As University of Alberta ecologist Lee Foote suggested in 2014, reclamation might be more for public show: "The main aim is to get the social license that is needed for these companies to continue operating." To apprehend the impact of oil sands development, you need to use a series of perceptual tricks. You have to pay attention to what’s seen and unseen, to peer from the height of a satellite and the depth of an underground mine, and to move backward and forward in time. A single public road leads north and south from Fort McMurray. A corridor of natural forest surrounds Highway 63, screening industrial development from the traveler’s eye. It's from the sky that you can best see how oil sands operations are deconstructing the natural landscape. And it’s only over time that one can perceive how far and how fast these operations have grown. 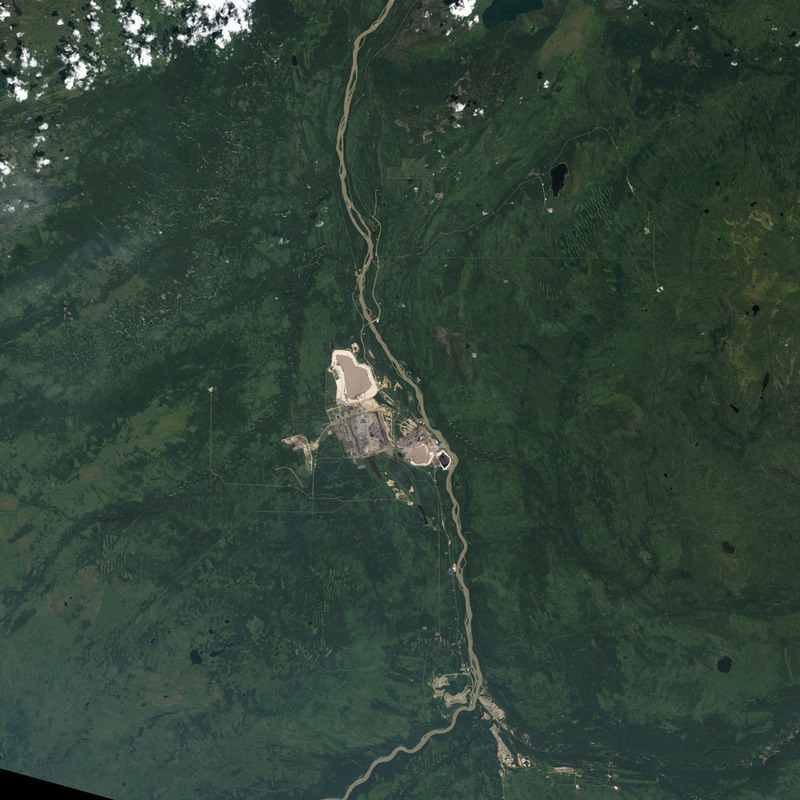 This series of satellite images tracks growth in the oil sands operations from 1984 to 2011. Today, they occupy a space the size of Detroit. The impacts of oil development are complex and immeasurable. To better understand the impacts, we'll examine stories about the impacts on three populations: water, birds, and Alberta's indigenous people. The climate-stressed Athabasca River is losing water to industry, while simultaneously absorbing its contaminants. Oil operations require large quantities of fresh water: 1.5 barrels of water for every barrel of oil produced. Although industry claims that 80 to 90 percent of water used is recycled, oil production still accounts for nearly three quarters of water use from the Athabasca River. For a river already suffering from contamination and declining flows, it’s a significant load. It weakens ecosystems downstream, which in turn affects the people and animals who depend on the river’s health. In the meantime, toxic wastewater seeps out of tailings ponds at an estimated rate of more than 11 million litres per day. It's impossible to keep contaminated wastewater safely contained. The oil industry assures the public that it monitors and manages seepage, but there is little publicly available information to substantiate these claims. Inadequate monitoring and a lack of industry transparency make it difficult for researchers to assess the true impact of oil sands production on water quality. While many signs of pollution are invisible, some are obvious to the eye. In May 2015, The Guardian described forests “reduced to a thin and spindly shell … entombed in thick coatings of dust.” Some locals refer to them as "drunk trees": starved for water and poisoned by high sulphur and nitrogen dioxide levels, they stand in stark contrast to our image of majestic forests. Each spring and fall, the Peace-Athabasca Delta serves as a home to as many as 1.5 million migrating birds. It’s the second-largest freshwater delta in the world, and an important site for waterbirds. The delta is also 150 km away from where oil sands development begins, and human-animal conflicts, as they’re called, are inevitable. Even a slight amount of bitumen can destroy a bird’s ability to fly, float and forage, so oil companies are required to take measures to deter waterbirds from landing on tailings lakes. Like airports, they use devices like air cannons and scarecrows. But in spring of 2008, a flock of 1600 ducks landed on a tailings lake managed by Syncrude. Deterrents were not yet in place for the season: many of the birds became coated in oil and died. Citing absence of due diligence, the provincial court found Syncrude guilty, and ordered the company to pay $3 million in fines and an additional $2.45 million to fund research, conservation and education initiatives aimed at the welfare of migrating birds. In October 2010, just three days after the sentence was handed down, a flock of 550 birds landed on six tailings ponds. Each of the ponds had functioning deterrents in place, and no charges were laid. In her 2012 report funded by the earlier judgment against Syncrude, biologist Colleen Cassady St. Clair concluded that it was winter weather, and not the oil industry that was responsible for the birds’ deaths. Alberta is a young province in a young nation. It’s both geographically and culturally isolated from the Eastern Canadian seats of power. Most people in Fort McMurray are newcomers. But what if you weren’t a newcomer? And what if the region wasn't 'the middle of nowhere', but home to you and your ancestors? The Athabasca region's First Nations communities predate oil companies, Alberta and Canada by thousands of years. In a traditional culture based on close links to the natural world, the impacts of oil development have devastated identity, livelihood and health. Regional wildlife such as moose and muskrat have been found with elevated levels of arsenic, mercury, and other contaminants in their bodies, forcing indigenous people to curb their traditional hunting and fishing practices. Local residents no longer drink the water, and they've shortened their showers in response to an alarming spike in rare cancers. When Dr. John O’Connor first spoke out about an increase in rare cancers in Fort Chipewyan, he was initially accused of misconduct by Health Canada and dismissed from his post. This was not surprising: under the leadership of Prime Minister Stephen Harper, the Canadian government had established a well-documented practice of muzzling climate scientists and other experts who spoke against industry. To get to the market, Alberta’s oil must be moved to the market by rail or by pipeline to refineries and distribution hubs across North America. There is no foolproof mode of transportation. Pipelines, trains and trucks are all subject to failure, human error and cost-cutting practices, with deadly consequences. Calculating the risks of transportation becomes a game of “pick your poison”. It's cheaper to move oil sands crude through pipelines than trains. Citing disasters such as the devastating 2013 rail accident in Lac-Megantic, Quebec that killed 47 and blanketed the town’s center in 1.5 million gallons of light crude, the oil industry advances pipelines as the safer option. While pipelines are less likely to fail through dramatic events, they do fail. Leaks can go unnoticed for months, particularly in remote areas. In the time it takes for someone to notice, and a company to take action, several trains' worth of pollution can be released into the environment. Where through trucks, trains or pipelines, transporting oil transects categories we prefer to think of as fixed: public and private land, nature and industry, the visible and the invisible, national borders, remote northern forests and daily life in the towns and cities of North America. Pipelines often function invisibly, buried underground with little more than an obscure sign indicating the location of hazardous materials traveling below. Unique to the oil sands, and the cause of much controversy, is the raw form in which its products are transported through pipelines. Bitumen is too thick to flow freely, so it's diluted with benzene. When leaks and spills occur, this mixture of diluted bitumen, or dilbit, behaves differently to crude. The mixture breaks apart, making it virtually impossible to contain and clean. These issues came to the fore in the debates over the proposed Keystone XL pipeline. Had Keystone XL been approved, it would have carried Alberta oil from Hardisty, Alberta all the way to Texas, joining the existing 350,000 miles of pipelines carrying liquid petroleum products in the US and Canada. In 2010, an Enbridge pipeline carrying dilbit leaked and spilled into the Kalamazoo River, sending bitumen to the bottom of the lake, noxious benzene fumes into the air, and other chemicals downstream. It was a disaster that exposed the ignorance of both industry and agency to the dangers of this unique oil sands concoction. Neither Enbridge, the EPA nor local officials were prepared for a pipeline leak of this magnitude, and in fact, the industry denies that dilbit spills are more catastrophic than crude. Traditional methods of cleaning crude oil spills such as skimming, vacuuming, and floating booms proved futile in Michigan: $1.2 billion and several years later, the river is still contaminated. Pipelines aren’t the only way that Alberta oil comes into contact with North American neighborhoods. The trail of open-put mining waste makes a surprising set of journeys. Petroleum coke, or petcoke, a dusty byproduct of bitumen upgrading is shipped across the border and trucked south to cities like Detroit and Chicago, where it's stored in massive piles in poor residential neighborhoods before being exported overseas. Petcoka is cheaper than coal, and dirtier too. It emits 30 percent more CO2 per ton, making it the dirtiest fossil fuel on the planet. Oil sands production and processing releases roughly 14 percent more greenhouse gas emissions into the atmosphere than the average oil used in the U.S. This includes the removal of carbon-absorbing boreal forest and peat, the fuel needed to run heavy machinery and upgraders, and large quantities of natural gas to melt out deeply buried bitumen. More greenhouse gases mean higher average global temperatures and more unpredictable weather patterns. There is a link between oil sands extraction, climate change, and the higher frequency and greater intensity of wildfires, particularly in the western US and Canada. Higher temperatures in both warm and cold months exacerbate natural drought cycles, shrink winter snow packs, and increase the frequency of heat-related lighting. Interestingly, while humans cause more wildfires, lighting events tends to spark much larger fires – ones that burn more territory and are harder to extinguish. On May 1 of this year, an exceptionally hot, dry spring in the boreal forest coupled with an unusually light snowfall last winter set the stage for an enormous and rapidly spreading fire in northern Alberta, not far from the oil sands. While years of provincial fire suppression policy also contributed to conditions that made the region ripe for a large scale wildfire, very few people anticipated a situation where over 80,000 people had to be evacuated. Luckily, thanks to an extraordinarily well-coordinated emergency response, not one fatality was reported. These days, twice as much land in Canada is being consumed by fires than in the 1970s—and could increase up to fourfold in the coming decades. In fact, if dramatic wildfires such as this one burn annually, some scientists believe the boreal forest could eventually be transformed into dry savannah. Ironically, it is not just the region’s forest, wildlife, and human residents at risk. The very reason for the growth of Fort McMurray and one of the major contributors to rising global temperatures–the oil sands industry itself–is at risk from the increasingly hostile effects of climate change. Addressing world leaders at COP21, the United Nations Climate Change Conference in Paris last November, Canadian Prime Minister Justin Trudeau declared, "Canada is back". He vowed that climate would once again be a "top priority" for Canada. He pushed for the inclusion of indigenous rights in the climate deal. He insisted that economic growth and climate issues are compatible, pledging $300 towards clean technology and innovation. Trudeau's position aligns with a growing consensus of Canadian businesses and citizens towards energy diversification. Canada’s climate goals are incompatible with Alberta’s irresponsible approach to reducing emissions. In Alberta, Premier Rachel Notley seems to walk a fine line between avoiding the alienation of the province’s largest economic contributor, and acknowledging that a carbon tax on the oilpatch is a critical move in improving Alberta’s emissions rates. However, the oil sands are in fact negating the progress that seven other provinces have made, and projections show that by 2030 Alberta’s emissions will rise despite reluctant efforts to curtail them. Alberta’s economy is directly tied to the success of fossil fuels. When oil prices were high, the province was soaring economically, posting budget surpluses of over $1 billion. But since the 2014 slump, Alberta has suffered, and will become the only Canadian province whose economy will shrink this year. But is the Canadian economy as dependent on the oilpatch as Alberta claims it is? In the near-term, and perhaps in the eyes of investors, Canada is still connected to the price of oil. While Alberta’s oil and gas industry contributes just 4 percent to Canada’s GDP, the Canadian dollar has followed oil prices down as well, performing second to last among other G-10 countries’ currencies in 2015. Whether real or imagined, the country’s apparent dependence on petrodollars has made it susceptible to fluctuations in oil prices. Many contradictions lurk just below the surface. This past week in Ottawa, the “Three Amigos” – President Barack Obama, Canadian Prime Minister Justin Trudeau and Mexico’s President Enrique Pena Nieto conducted a one-day summit where they committed to 50 percent clean energy generation by 2025. Canada agreed to lift Mexican visa requirements, and Mexico agreed to open its market fully to Canadian beef. But with animal agriculture contributing a staggering 51 percent to global GHG emissions, does it make sense to give this industry a pass in the midst of a deal to curb emissions? Canada has already admitted that it will overshoot its 2020 emissions target by 20 percent but Trudeau seems reluctant to offend either the provinces or the oil sands industry, and has implied he will give Premier Notley the oil pipeline Alberta wants. In British Columbia, Trudeau’s government is supporting the controversial Site C Dam, as well as two LNG (liquified natural gas) projects. We must take note of the grand paradox between the US’ and Canada’s international grandstanding, and the decisions made at the provincial and national level. Proponents of the oil sands are facing both financial barriers and public resistance. The energy return on investment for surface mining is a 5:1 ratio, meaning that for every unit of oil spent on its extraction, shipping, refining, only five units are gained. In situ returns are merely 3:1. With a minimum $100 per barrel price required in order for new projects to generate revenue, it is becoming increasingly difficult to justify the industry’s growth. Climate impacts have begin to hit home in an unprecedentedly way in the form of wildfires and superstorms, but will we begin to feel a shift in our local and national practices–energy, economics, individual choices, and political decisions?